Making your own eyes using beadchain is quick, simple and cost saving. In addition it allows you to design them to suit your own needs. Take some bead chain in colour of choice but black and orange seem to the most favoured. Cut the chain into individual pieces. 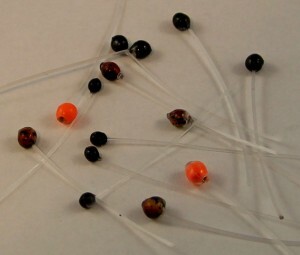 Thread some monofilament through the bead – 40lb for medium size, 30lb for small. To stop the bead slipping off, melt the end of the mono and while still hot press it flat. If you wish, blacken the end with a black permanent marker. Apply some UV glue over the entire eye. The added advantage of using the beadchain is that provides weight and does away with the need to attach barbell eyes on some flies.